Located in the Wisconsin region, Madison is a town and its area, population and various key information is listed below. For all your administrative procedures, you can go to the city hall Madison at the address and times indicated on this page or contact the town hall’s reception by phone or by email depending on your preference or the information available. Madison satellite image: Madison town from the sky! Directly off Interstate 90 and across from the Yahara Golf Course, this hotel offers easy access to downtown Madison along with comfortable rooms featuring microwaves and mini-refrigerators. Best Western East Towne Suites offers free shuttle services from the Dane County Regional Airport. This all-suite Madison, Wisconsin hotel features an indoor pool, hot tub and free Wi-Fi. This hotel is 6 miles from downtown Madison and The Henry Villas Zoo. 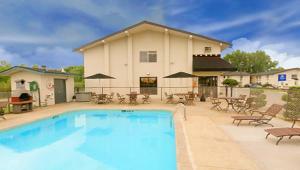 The hotel features an indoor heated pool, gym, business center and rooms with refrigerators. Country Inn & Suites by Carlson Madison rooms include a microwave and coffee maker. This Madison Hotel is located off Interstate 90 and 94 near the Alliant Energy Center multipurpose venue, and offers free Wi-Fi. The Sleep Inn & Suite Madison offers continental breakfast each morning and free weekday newspapers. This hotel is located in Madison, Wisconsin and is a 10-minute drive to the University of Wisconsin. The hotel features an indoor pool and hot tub, in-room refrigerators and free Wi-Fi.